I woke up yesterday craving granola. Specifically, the maple granola that I used to eat with yogurt for lunch every day when I was in the 5th grade. It was my favorite and could be bought only from the bulk bins at People’s Food Co-op in SE Portland. We didn’t live anywhere nearby, but my mom often made the trip to stock up so that I could have a lunch that made me happy (5th grade was a particularly hard year for me). I’ve been out of granola for a couple of weeks (I finished the peanut butter banana batch right around Halloween). It hasn’t been a great hardship, as there were still bowls of oatmeal, scrambled eggs, or slices of peanut butter toast to be had in the morning. But there was a space on the shelf where a jar of granola could go, and with that craving still whispering in my ear, I decided to make a batch. I did not reinvent the wheel with this granola. Instead, reached for my cookbook and opened it to the recipe for Maple Pecan Granola (I’m a little bit embarrassed by how often I reach for the book I wrote to refresh my memory of certain recipes. You’d think I’d know them all by heart but I most certainly do not). That recipe uses melted butter, pecans and dried blueberries for a super rich granola that tastes much like a good, crispy oatmeal cookie. I didn’t want something quite so rich and I didn’t have any pecans in the freezer (the best place in the world for nut storage) and so opted to use olive oil in place of the butter, swapped in walnuts, and skipped the blueberries entirely. As this batch of granola baked (I did this one at very low heat for a long while – a tip I’ve gleaned from Megan Gordon and the writing she’s done about her granola company, Marge), the apartment filled with the most glorious smell of toasting nuts and warm maple syrup. It was the aromatic embodiment of cozy productivity. 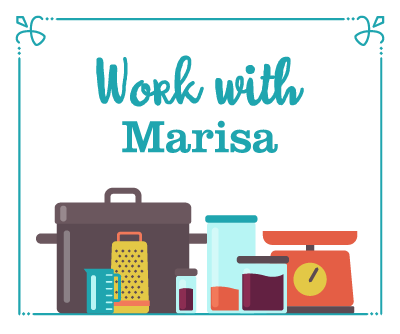 One of the things I’ve still not quite gotten used to about my job as a blogger, teacher and author is the fact that I have a very distinct busy season. Things pick up for me around April and they don’t slow down much until the beginning of November. By the time we hit this time of year, I need a break but it always takes me a couple of weeks to remember how to relax and slow down (transitions have never come easily to me). 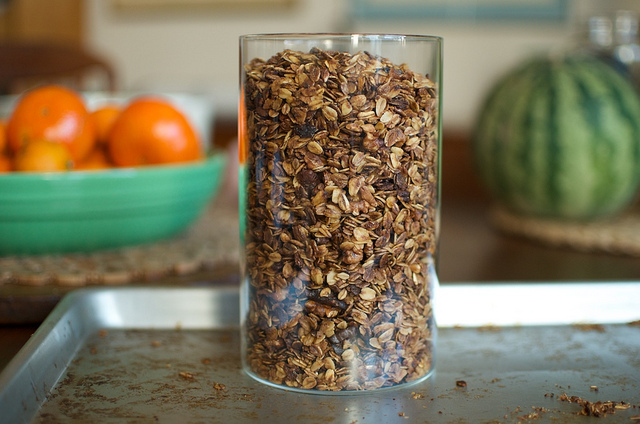 Making this granola helped remind me that it’s okay slow down a little and just enjoy the scent. So now I have a lovely jar of granola, and finally am feeling a little more at ease with myself and the slightly slower days. 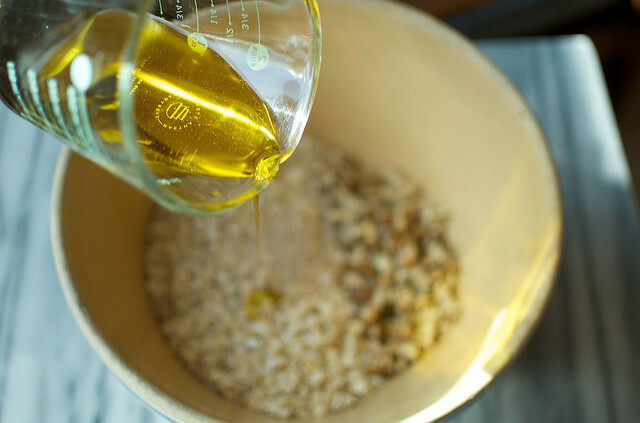 Who knew that following a morning urge to bake granola could be so helpful! Oh, and one more thing. 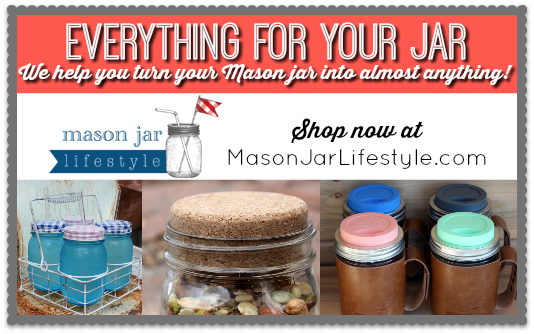 You’ll notice that I’m not storing the granola in a mason jar (I know, it’s blasphemy) and instead stashed it in one of OXO’s flip lock glass canisters . 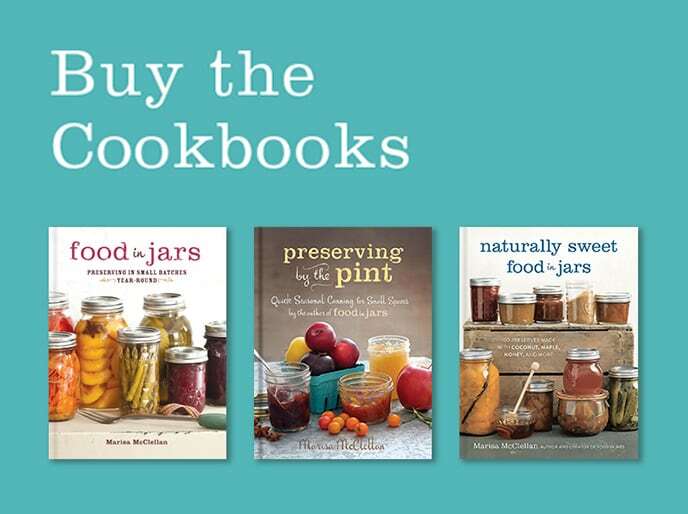 I got a couple of these jars last June at Eat, Write, Retreat and they are one of my favorite things for foods that get accessed a lot. 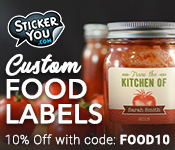 Instead of twisting off, you flip up the lever on the jar and it releases the seal. 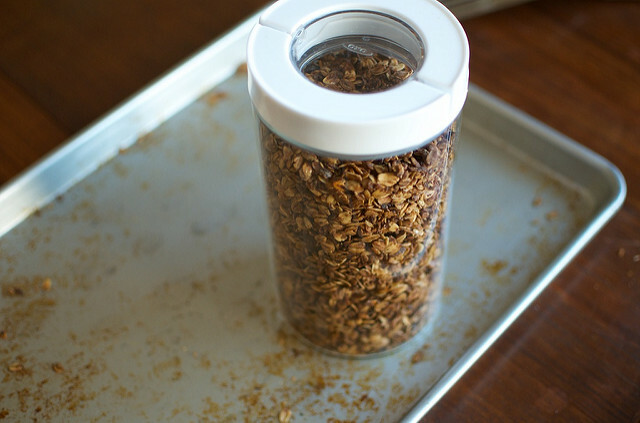 Take out the granola that you need, pop the lid back on and press the lever back down to seal the jar again. I like them a whole heck of a lot, but they were (disclosure!) free from the swag table, so I thought you should know. 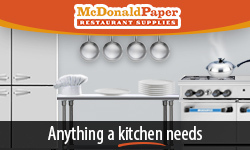 Spread the mix out on a large rimmed baking sheet. 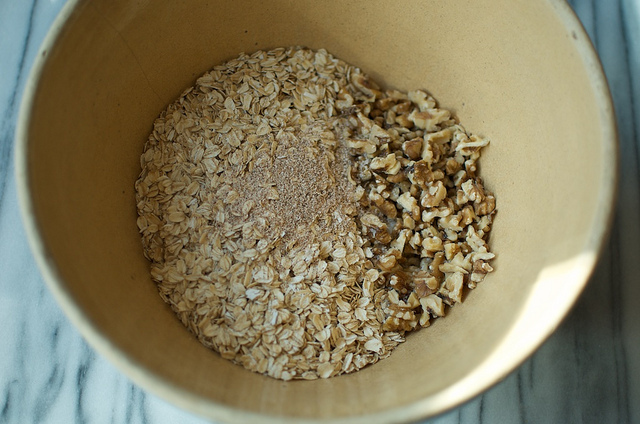 Bake for 30 to 40 minutes, stirring occasionally, until the granola is fragrant and golden brown. 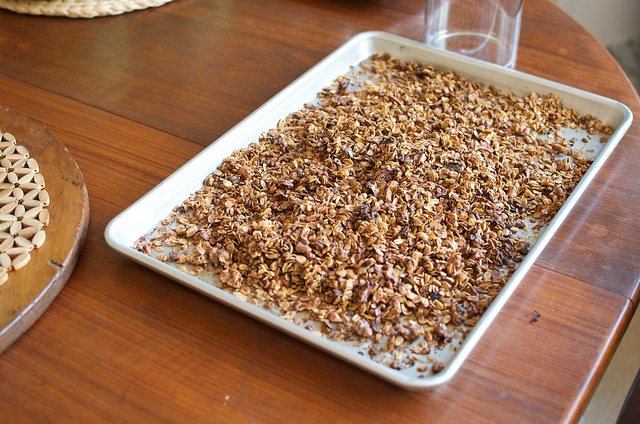 Remove pan from oven and let granola cool undisturbed for at least half an hour. 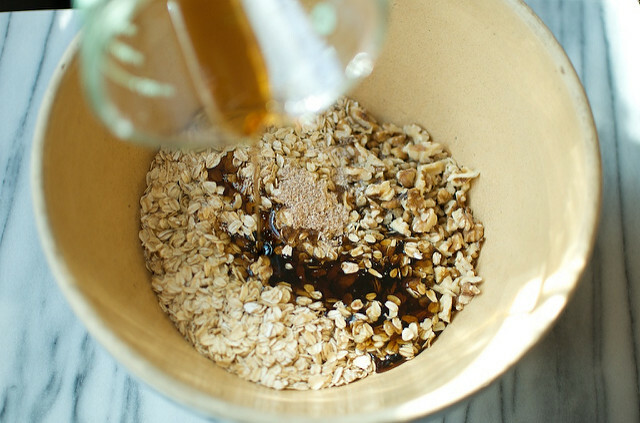 When granola is just barely warm, use a spatula to scrape it off the pan, taking care not to break up the clusters. Funnel into an airtight container to store. It will keep for at least a couple weeks. 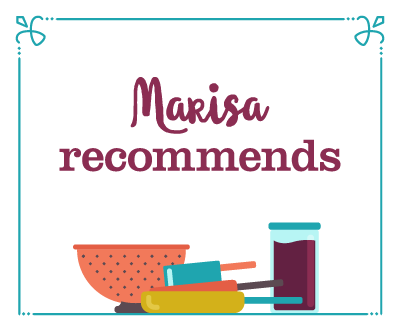 Hi Marisa – Just wanted to let you know that the recipes in your book (and blog) have lead to an obsession with homemade granola that’s been ongoing since your book first came out! I’ve been eating granola and yogurt for breakfast at least 4 days a week since then! I’m especially smitten with crystallized ginger in granola and use your recipes as a base for various nut, fruit and seed combos. Now I need to stop being a cheapskate and use 1/2 cup of maple syrup to sweeten my next batch! I save my real maple syrup for other things . I made this recipe with imitation and it is yummy. I have used real and really cannt taste much difference. I have been making my granola in a frying pan, with a bit of coconut oil, oats, some all spice and coriander, coconuts, nuts (hazel and cashews) and dried cranberries. 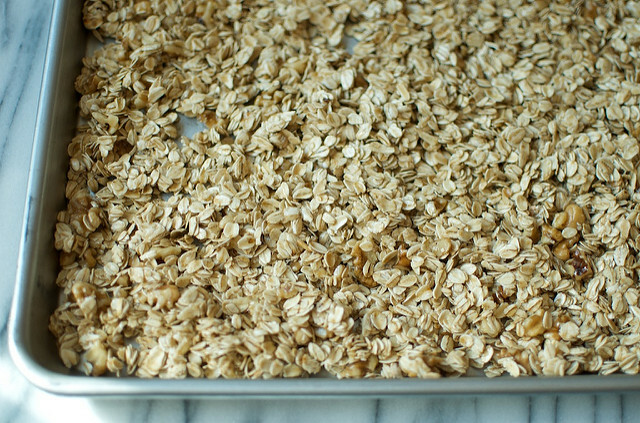 After browning all oats and other stuff in a pan – I add a bit of maple syrup and cook a bit longer. It is yummy and no longer any burnt granola because I forgot and left it in the oven too long. I use an older plastic version of the xox’s with a push button top, for my dishwasher powder I make. Works wonderful, big enough to scoop from, and the “air seal’ keeps out the moisture so the powder don’t clump up. Sounds wonderful, I love infusing maple syrup in any and everything these days. Perfect timing, as I am so in need of granola for my breakfast yogurt. Plus I am thrilled to have all the ingredients on hand including Maine maple syrup. 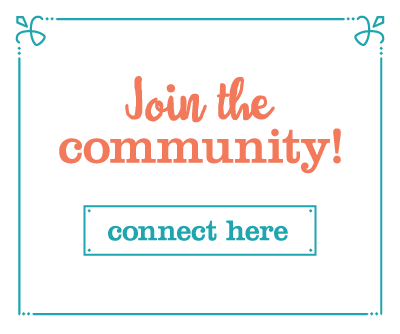 Thanks for sharing and inspiring. What a lovely food memory from what sounds like a fairly alternative childhood, yoghurt and maple granola as a childhood treat. I haven’t made granola for years but I’m feeling an urge to bake up a big batch now. About how much does this recipe make? Thanks! About 4 to 5 cups (the measurement depends on how tightly you pack it).